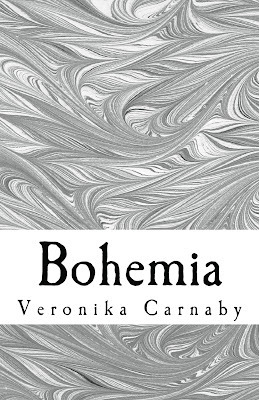 At first glance, I wasn't too sure if Bohemia would be my kind of book. Set in the Sixties, I didn't feel that I would be able to find any connection with the characters whatsoever, however I was pleasantly surprised by how intrigued and interested in Valerie I became. The book essentially reads like Valerie's autobiography, walking us through her nomadic lifestyle throughout the years. Much like others of the generation, Valerie and her friends Emm, Lester and Jimmy simply pack up and move on once they tire of the place, thus creating an ever growing flow of characters. There are characters you learn to love and those you learn to loathe throughout the novel as you experience life through Valerie's eyes. I enjoyed the story, the author Veronika Carnaby did a great job with her research of the era and the characters were incredibly well written and full of personality. however I did struggle with was how quickly events seemed to happen; the first part of the book seemed to happen within a couple of days which I know is not possible and probably wasn't meant to appear this way. I struggled a little at first but once I got into the heart of the story, I found myself constantly turning the virtual page, to see what happened next. Whilst this may not appeal to every reader, if you are a fan of the 1960's era and the free, nomadic ways that come with it, this book is definitely for you! If you're not a fan of those but are looking for a fresh new read, I'd definitely check this out. or in ebook form here . Check out Veronika's GoodReads page here. *Affiliate links are included in this post. To buy this book without using an affiliate link, click here.